I’m not sure what it is about snakes, but I’ve had an affinity for them since I can remember. As a small child, I used to scare my parents to death when I’d come home from a walk in the neighborhood or while on vacation with a snake winding around in my hands. Most were non-poisonous, but I do recall catching a “water” snake in Northern Michigan that created quite a ruckus when my relatives figured out what it was. 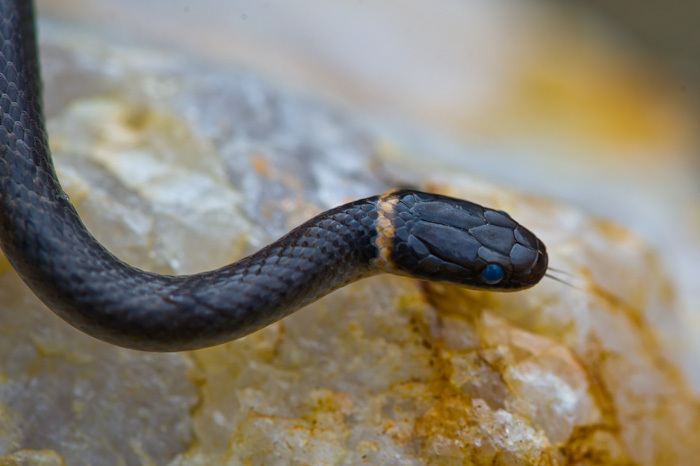 Thankfully, my snake adventures of late have been with friendlier types, such as this Northern Ringneck snake. I first caught him on Saturday while we were doing some yard work. This morning, Cam found him again sunning himself in the driveway, and we decided to take some photos before we put him back under the planter he calls home. While I’m more careful now with the snakes I meet, they still intrigue me and I enjoy knowing at least some creatures out there appreciate my gardening. Hurrah for people who like snakes! Grandson Sam just got a baby boa for his birthday and it is beautiful. I always warn our yard men that they are not to kill snakes or spiders at our house. Cam is OK with snakes, but I don’t think he would have one for a pet. Good for Sam! I, too, share the affinity for snakes and spiders and such. Once when I lived in Texas, my garage was home to a spider’s bulging birth sack, just like in Charlotte’s Web. So many friends wanted to knock it down, kill them off–how barbaric. They were not hurting anything–and are just fascinating! As a kid, I had a tarantula as a pet for a while–they tickle as they walk up your arm. Thanks for sparking some fun memories. Hey Patti! My Mom also had tarantulas as pets while I was growing up. I liked playing with them, too. In fact, she just gave her last one back to Lucinda a few months ago. We’re on our way home from her house and I noticed yesterday she has a large spider web with an egg sack off the front porch. She said she won’t knock it down until the spiderlings are born! What an absolutely beautiful snake! (I love snakes too, love having one as my Chinese zodiac sign) Great shot, great text, nicely done! Thank you, Noel! I’m a Gemini but wouldn’t be surprised if I was supposed to be the sign of the snake, too!